Hey Brian! As a lawyer, you must hear some crazy stories. (TRUE). You probably have lots of strangers calling you every day, wanting to discuss their legal problems (TRUE). What are some of the most commonly asked questions of you (GOOD QUESTION). As an injury lawyer, we hear of, and see lots of crazy things; lots of sad things; and lots of things that you just can’t make up. Some of these stories, I’m not at liberty to share with the general public. Regardless of the severity of the injury, one thing that ties most clients together are their questions and concerns for their respective cases. From Toronto to London to Peterborough, client questions are generally the same. Just shows you that geography, race, culture, creed; it doesn’t really matter. People are people, and they share many commonalities regardless of your background, upbringing, or the mechanism and nature of the injury. So, without further a due, here are some of the most commonly asked questions we here from inquiries to Goldfinger Injury Lawyers. 1. Are you a lawyer? Am I speaking with a lawyer? Yes. I’m a lawyer. Just like Harvey Levin from TMZ who proudly announces to the world in the closing credits of his infamous tabloid show TMZ “I’M A LAWYER“. If you think this is a silly question, I assure you that it’s not. At some law firms, clients don’t speak with lawyers; or if they do, it’s very rarely. This is not the case at my law firm. On the flip side, there are some people out there who represent themselves to be lawyers, when in fact, they are NOT. Basically, they are lying to prospective clients to get retained. Some of these people are paralegals, law clerks, or just ordinary people who have some experience dealing with insurance companies who work for a law firm, or paralegal practice. In any event, it’s a pretty shady practice. I generally see this sort of thing in Toronto and around the GTA. This rarely happens outside the GTA. On the flip side, in more remote areas of Ontario, like say, Kirkfield or Innerkip Ontario there aren’t many lawyers around. So, finding a lawyer, especially one who practices in exclusively in the field of Plaintiff Side Injury Law; can be very difficult. So, when these people call our office and find out that they’re speaking with a lawyer, and that a lawyer will meet with them FREE OF CHARGE, and perhaps take their case on a “don’t pay until the case settles basis“, then there’s some genuine excitement and disbelief. Both are reactions which give me great pleasure. It’s always nice to be appreciated. Even lawyers can use some love sometimes. 2. Can I tell you about my case? YES! You can. This is what I do for a living. I listen to your problem, and if I can solve it, then I will. If you don’t tell me about your case, then I won’t know how I can assist you. Lawyers by their very nature are problem solvers. If there wasn’t a problem, then you wouldn’t need a lawyer in the first place. Even if the case is not litigious, people reach out to lawyers when they need help which is outside the realm of their knowledge (some would define this as a problem). If there were no problems to solve, there wouldn’t be any lawyers. So, go ahead. Speak to me until my ears bleed. Our law firm will listen to your problem and help you out as best as we can. I never tell people that they don’t have a case, particularly over the phone if I’ve never met you or reviewed your documents. What I can assess over the phone is whether or not the case is a proper fit for our law firm, whether or not we are interested or if I think we can be of assistance. After that, I would then be pleased to meet with you at one of our three offices across Ontario, of visit you at the hospital or at your residence. Whatever works best for you. Upon meeting with you, and reviewing your documents (if there are any available), I will have a better idea of whether or not you have a case. If I want to take the case, that means that I believe in you, I believe that you’re injured, I believe you’ve been wronged, I believe that you’re entitled to compensation, and that I believe that you have a case. Sometimes, there are clear barriers which prevent our law firm from getting involved in your case. Example: You’ve waiting too long to contact a lawyer resulting in a missed limitation period. Commencing a claim beyond an expired limitation period is a losing cause right off the bat, and will likely result in your case getting dismissed by a Judge for failure to comply with the Limitations Act 2002. This is the body of law in Ontario which governs limitation periods. Some are quick, other’s aren’t. It all depends on the nature of your case. 4. How much do your charge for fees? If we like you, and we like your case, we will take your case on what’s called a “contingency fee” basis. This is a fancy legal term that we will take your case on a “don’t pay until the case settles basis”, whereby our fees are based on a percentage of the amount recovered. The percentage that we charge is based on how your accident happened, the severity of your injuries, the complexity of your case, the degree of liability in your case, along with your “likeability“. If we like you, and we think a judge, jury and an insurance company will like you, and we think you have a strong case, then we will charge less of a contingency percentage. There is no straight forward, cut and dry answer to this question. First, 99% of civil cases settle without going to trial. That means that 1% of cases do go to trial. It can take many years before cases are ready for trial, and even when cases are trial ready, it does not mean that the Court has the resources, Court Room Space, or judicial resources to hear those cases. It’s NOT uncommon to have trials delayed on account of lack of Courtroom space, or due to a Judge shortage. It happens more frequently in civil matter because on the judicial resource totem pole, civil matter are the lowest. Criminal matters and family matters ALWAYS take priority to civil matters. Don’t believe me? Go to Court in Cobourg or Orangeville. There will likely be ONE judge sitting that day, hearing all sorts of things; from bail hearings, criminal set dates, family law motions and civil motions. Criminal will go first because a person’s human rights are at stake. That will be followed by family; because families are the backbone of society. And finally, civil matters will be heard because MONEY CAN WAIT. A person in custody, or an access and child support hearing CANNOT wait. That’s just the way it is. The amount of time required for a case to settle outside of Court depends on a variety of factors. It depends on the adjuster, the lawyer for the defendant, the speed at which medical records are exchanging hands, along with your injuries. Some cases can take many months, others can take many years. There is no clear cut answer to this question. All that we ask our clients to do is to focus on their wellness and rehabilitation, and to let us take care of the rest. The more a client thinks and focuses on their case, the more anxious, tense and nervous they will become. There are so many factors in a legal proceeding which are outside of the control of a client, and a lawyer for that matter at times as well. It makes no sense for a client to get all bent out of shape and stressed out over things which they cannot control. The only thing that they can control is attending at their various doctors appointments, and focusing on getting better. If ever you have a question about the progress or status of your case, call us! We would be happy to chat with you about it! 6. How much money is my case worth? This is another simple question where, unfortunately, there are no simple clear cut answers. Every person is different. Every accident is different. Every injury is different. Every case is different. Accordingly, damage awards might similar, but they are NOT the same for every case. In car accident cases, there is a $30,000 deductible for pain and suffering awards which fall below $100,000. That means that if a judge awards you $99,999 for pain and suffering, that’s only $69,999 after the $30,000 deductible is applied. But, if a Judge awards you $100,001, then you get to keep that entire $100,001. Does that make sense? Really weird law that I didn’t make up. I understand the law. But, I must admit that I don’t see the rhyme or reason behind it. It was essentially put in there to screw innocent accident victims like you out of money. The only beneficiaries of these laws are the large mutin-national insurance companies who cash in on the profits. Ask yourself. Have your car insurance premiums gone done in the past 5 years? 99/100 people surveyed by Goldfinger Law responded that their premiums have actually increased over the past 5 years, in spite of these draconian laws put in place under the charade to keep premiums down. In any event, the valuation of your case depends on a LOT of factors such as age, past/future employment, past/future care, pre-accident history, nature/severity of your injury, apportionment of liability, and what type of accident it was (car, dog bite, fall, disability claim). The behaviour of the Defendant/at fault party can also play in to the valuation of your case when it comes to a bad faith claim, or claim for aggravated or punitive damages. There are a LOT of variables when it comes to valuating a case, so, unfortunately, there’s no one clear cut answer to that question. 7. When can I meet you and where can I meet you? Call me to set up a date and time to meet at one of our 3 offices (Toronto, London, Peterborough). If you can’t make it to one of our offices, then we will come to meet with you. Whether it’s at your home, at a hospital bedside, or at your local library in a conference room. We are happy to meet with you wherever is best for you. 8. Can take a picture with you when the case has settled? YES! If we have been successful in recovering money on your behalf, you can certainly take your picture with me and my staff. It’s a fun way to remember the journey that we’ve shared together. 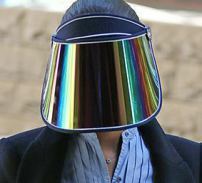 Just don’t show up to our photo shoot sporting a V. Stiviano mask. We’d like to see your face for the pictures!